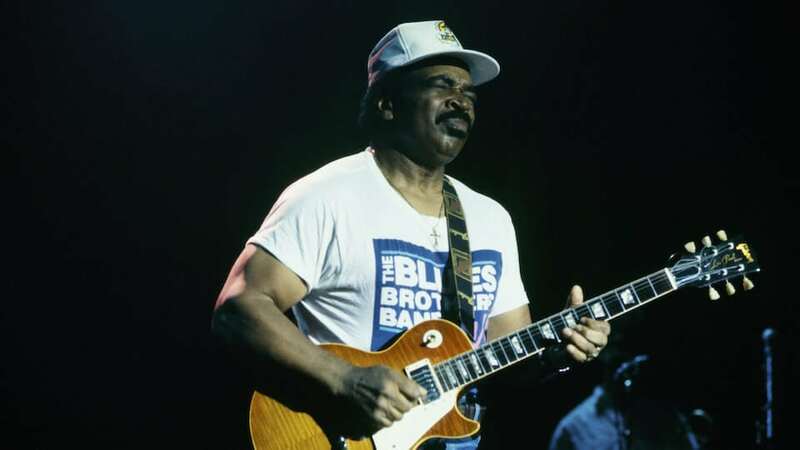 The only thing sadder than the passing of blues guitarist impresario Matt “Guitar” Murphy on June 16 would be if you only knew of his Blues Brothers work. In reality, Murphy was a sensationally unique guitarist whose 60-year career encompassed session artist, and lead guitarist in classic blues bands. Born near the heart of Mississippi Delta, he joined blues super-legend Howlin’ Wolf (Chester Burnett) in Chicago when he was 20, and toured with the band for the next 10 years. During this time, he also played on LP’s by legends like Ike Turner, James Cotton, Willie Dixon and Sonny Boy Williamson. Note not only his speedy blues picking but his incredible dexterity with repetitious licks, sometimes repeating the exact same note on a different string. This guy also knew when to sit back and dialogue a bit with Memphis Slim on piano or pop in for some simple accents for Bill Stepney’s stellar drumming. Even on a piece that bears his name, Murphy was never one to hog the spotlight. Despite never professionally trained, his picking is nevertheless technically perfect. Most marvelous is the completeness of the sound despite it being only a simple three-piece ensemble. This one kicks off with a vicious blues shuffle on the growly low end of Murphy’s guitar before screaming into some high-speed flutter finger picking later in the tune. And once again, his perfect bends and rhythm work behind his cohorts’ solos make him the ideal bandmate. Listen closely and you’ll hear Murphy’s unique way of combining jazz chords with a blues style of playing resulting in a technique that changed expectations of what jazz itself could sound like. When teamed up with Memphis Slim and bassist Willie Dixon, Murphy became a veritable fixture in blues festivals in the early 1960s. This song illustrates why. At age 73, Matt Murphy suffered a minor stroke, but got right back to performing a few years later, appearing in blues reunion shows at the Chicago Blues Festival, Eric Clapton’s Crossroads Festival and here at the Mystic Blues Festival where he slathers on some sweet and saucy blues licks alongside Christine Ohlman and Rebel Montez. What other blues guitarist evokes screams from the audience by way of delicious pentatonic licks? If seeing his smile surface during this gig doesn’t warm you, your heart is dead. This guy clearly enjoyed playing blues! In 1963, the great Memphis Slim played on a series of live albums recorded as part of the European TV show Jazz Prisma. Skip to just after the 5-minute mark to enjoy the groovy word-smashing Sonny Boy Williamson covering Big Bill Broonzy’s classic “All by Myself”. Sonny Boy repeatedly throws it over to Murphy, quietly interjecting comments about Murphy’s tasty licks. With amazing finger work and subtle ghost notes, Murphy is the perfect backing to this blues luminary. (He provides backing for the entire 20-minute video.) We urge you to sit on the porch with a Mint Julep and take it all in. Again from the 1963-1964 Prisma series, we serve up a heap of Murphy’s sizzlin’ guitar riffing in the wonderful “I’m Lost Without You” by Memphis Slim, with Bill Stepney on drums. It’s a short but it’s tasty. Most notable is Murphy’s talent for cleany-clean speed picking and his expert bending, providing the perfect solo break. For the rest of the song he lays on a solid rhythm section, including a staccato chord walkup. A good jazz-blues guitarist knows when to lead, and when to disappear into the background. Example A. RIP.